Guess What I've Been Up to Lately...A DIY Outdoor Cat Enclosure for My Furbabies! Guess What I’ve Been Up To Lately…A DIY Outdoor Cat Enclosure for My Furbabies! Build a DIY Outdoor Enclosure and Let Your Cats Have their Cake and Eat it Too! Hey guys…been away for a little awhile but guess what I’ve been doing? Yep, the creativity bug has bit again and this time I’ve been working on a diy outdoor cat enclosure for my 3 cats to have a little outside freedom within reason. If you have indoor cats that you’d like to give a taste of the outdoors without compromising their safety – read on – and best of all I’m going to show you how it can be done. Don’t spend money you don’t have on an expensive kennel! With this project you can kill 2 birds with one stone and have happy, safe cats and probably spend about $200 (give or take) on supplies in the process like galvanized wire . And better yet, it’s going to look a heckuva lot better than one of those boring metal cage-like structures! 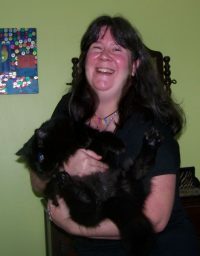 Although this is not a pet product blog you’d be surprised at the creative ideas that pet ownership can muster up. Things like toys, perches, and habitats are things that lend themselves to new and innovative ideas. Why Build an Outside Cat Enclosure? How To Build an Outdoor Cat Enclosure! What's the Easiest Way to Build an Outside Cat Enclosure? Don't Just Stop There...Make Your DIY Cat Enclosure A Pet Paradise! It’s only natural for housecats to want to experience the sights and smells of the outdoors…but with so many potential dangers out there, we concerned pet parents want what’s best for them and that means making the backyard a safe haven. I knew this as well as anyone, so I was making some DIY cat enclosure plans a few years ago…with some blueprints on paper (anyone who loves to draw really “gets” blueprints!) a $200 budget, and some materials. We used 4 by 8 foot sheets of lattice designed lumber, cedar planks and assorted nails and screws. It probably took my husband and I all of one spring to complete the “kitty corral”…after a little initial reluctance on the cats’ part they did take to it 🙂 I always get the itch to go outside too in the spring and even though the structure was a great start, I felt it could be improved upon which is what I was doing as I stated earlier. This past week I managed to make that thing bigger. So if you’re following me we started out with a 4 foot by 8 foot entry level size and then with a little extra work and maneuvering doubled it to an 8 foot square so our little guys could have more room! Now this is not the only way to do it..unlike us, hopefully you can decide on a size that would be just right in the first place 🙂 There are a number of things up for consideration here – how many cats do you have? How big does your layout need to be? Are you wanting to create a “cat run” (like a tunnel) or a box shape enclosure? Now moving on to the how-to’s! Determine the place to mount the cat door… And you don’t need a degree in shop class to do this either; I installed mine right next to our window AC unit which worked like a charm. Next decide upon the desired size (this may be where blueprints on paper may come in) If you need to take some time to figure out the ideal width, length and depth by all means do it. Better to have a plan than come up short later if the work in progress doesn’t match what you thought it should. If you want to go bigger, go for it! It will mean more materials and legwork but that can open the door to all kinds of cool ideas like an all-out kitty playground, perches, tunnels, the sky is truly the limit! While these may vary according to personal taste, there is one thing that can’t be overlooked and that is the structure. You kinda have to think about this like you would building an add-on room. A room under construction has a foundation in place first – Ideally, the structure needs to be made of wooden lumber planks. 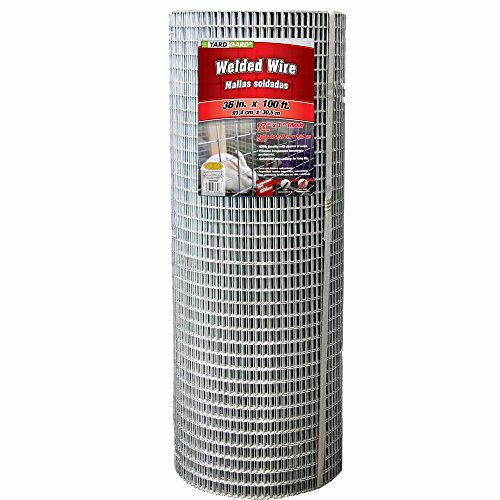 Steel wire mesh is sometimes labeled as “all purpose fencing” and has a galvanized outer layer to minimize rust. It has a 1 by 1 inch layout and 16 gauge thickness. It is very strong and durable and a staple product used in making enclosures for rabbits or chickens so it is certainly should be your go-to main material. You will have to cut the wire mesh as needed with bolt cutters. It is sold by the yard so it shouldn’t be difficult to determine how much you will end up using. A staple gun will affix the wire mesh to the wooden structure. Sometimes I used craft wire in a few places – you’d be surprised how strong that stuff is. 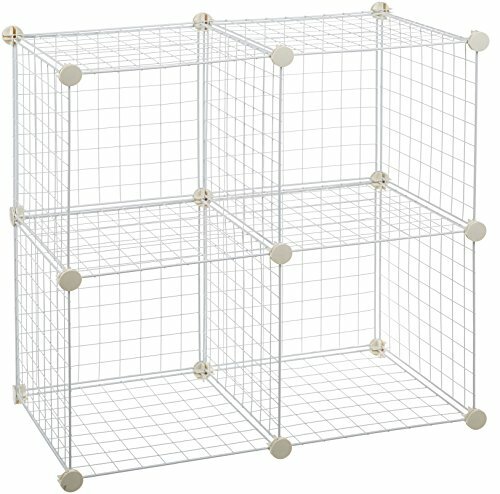 What’s the Easiest Way to Build an Outside Cat Enclosure? If you don’t have a builder’s bone in your body – fear not – I did read up on a very interesting alternate option after researching ideas for adding on to my enclosure. 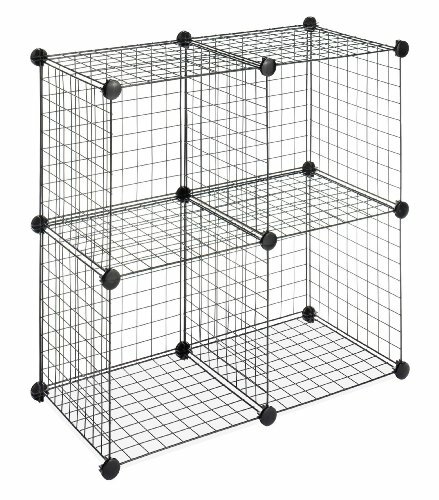 You can purchase some wire storage cubes made by Whitmor. They work great for animal habitats. The individual sides of each cube are made to be easily reconfigured as needed. 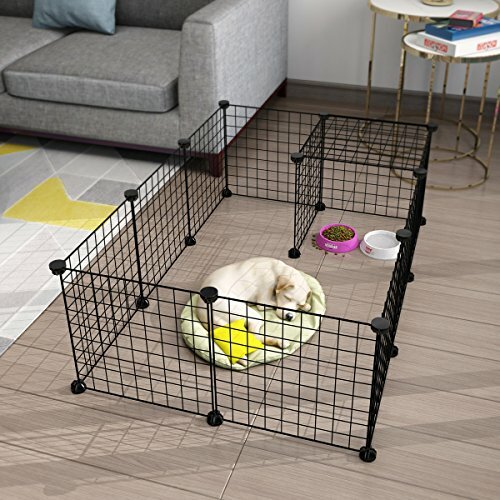 Some people were using them to make guinea pig and rabbit enclosures so just think a little bigger for cats in this case. A set of 4 is about $30 and so if you ended up getting 7 sets you’d spend about $210 but the process of putting them together would be duck soup because you wouldn’t need any other hardware other than a mallet and zip ties to secure them together. Don’t Just Stop There…Make Your DIY Cat Enclosure A Pet Paradise! As time goes by you may consider the addition of things like tunnels, various perches, or ramps. Cats like to be on high places, they like to explore, and keep an eye out for outdoor critters like birds or squirrels. I’m thinking about the addition of some solar lights surrounding the perimeter. That would look really cool and they could see where they are going since cats love to prowl around in the evening hours! There’s really no right or wrong way design-wise, so long as you’ve created a secure foundation so those little buggers can’t get out. So the three “s”s are strong, secure and stable. Then you can have fun with the inside elements too! Sometimes when building a cat enclosure, it can be difficult to really get all measurements correct. I know with my cat, if I even leave a small amount of space, he would be able to squeeze right out of the enclosure. I can definitely see how it can be a lot cheaper to build my own enclosure but I feel like buying a kit might be better suited for myself because I don’t want to take the chance of my cat getting out. Yes it was hard work I can assure ya! I still stand by what i said earlier about if I had to do it all over again, I would look into purchasing some of those stackable wire crates I mentioned…and if mine should have any setbacks ( bad weather lately -it’s still doing well but my umbrella wasn’t as lucky) I will be re-creating my furbabies’ special place with those crates!